So the $2 billion is a minimum. The actual total could be $4 billion, or whatever. That is starting to be real money. Who is Number 1? Goldman Sachs? Wells Fargo? Nope. The National Association of Realtors (NAR). It’s trying to get the government to inflate the housing market in myriad ways, for instance by dominating the mortgage industry, including guarantees and mortgage-backed securities, thereby subsidizing mortgage rates. It’s all about Realtors making more money because commissions are fatter if extracted from higher home prices. And the NAR is very concerned that the government might be cracking down on pandemic money laundering in the housing sector. The NAR gave more than twice as much as the next guy in line, namely a quant hedge fund, Renaissance Technologies, followed by another hedge fund, Paloma Partners, followed by another hedge fund, Elliot Management, followed by the banking trade association, American Bankers Association. The report lists many more entities by name. These are just the top 20. Clearly, Goldman Sachs, near the bottom of the above list, doesn’t need to spend that much money on campaign contributions and lobbying. It gets what it wants by other means, for example having its ex-executives play major roles in the administration and at the Fed. 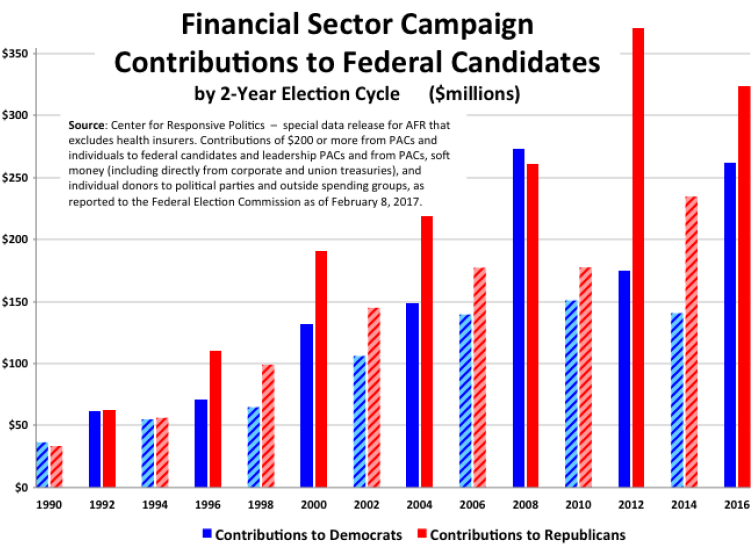 The chart below shows campaign contributions to Democrats and Republicans, based on contributions that were identified by party (only a portion are), with the federal election cycle in solid columns and the in-between years in striped columns. The Financial Crisis is already forgotten, except the key element for the financial sector, including the housing sector: they got bailed out by the government and to a much larger extent by the Fed – and they continue to get propped up with the still ultra-low interest rates and the Fed’s gigantic pile of securities, including mortgage-backed securities, that it has acquired during the phases of QE. So it’s no big deal, apparently, for these players if there is another financial crisis. But deregulation must happen. Financial reforms must be rolled back. The housing market must be subsidized more than ever. Bonuses, stock-based compensation, share repurchases, and commissions beckon. What is in reality a relatively small amount of money – just a few billion bucks, a pittance really – must be spent by the industry to reap the huge payoffs. As the old saw goes, you have to spend money to make money. This is in response to the retail post. Someone mentioned restaurants not doing well. Popeyes went from 5 to 78. Another great performance from an established restaurant in business for over 30 years. These companies have been in business for over 30 years. People who bet on ShakShak missed the boat on real winners. I have $1 million dollars if I bought 5000 ($25k) shares of Dominos in 2009. Who would have thunk that out of a fast food pizza place. I can get better fresh made pizza from the deli section of my grocery store for $10. I need to add that Dominos sales growth the past 5 years was 8.8% YOY…..Hmmmm……maybe stock buybacks had a play in this stock run of 3600%. Let us not forget Casey gas stations. I guess their pizza is really good too. LOL 400% stock gain on sales growth of 4.8% YOY. I am just wondering….is there a lot of air under these stocks or will they go sideways once the stock buybacks stop. DPZ has been averaging a buyback of 5% YOY over the past 5 years. Casey’s bought back about 25% of all its stock. Just visited Cartagena, Columbia for a week and alot of pizza shops are popping up there. I asked some people “whats up with that”? They said its new to us and we like it. Most people I saw looked slim. That pizza is about to make them phat or is that fat. I dont like crummy chain pizza. I guess some like it because its cheap. How about shorting the stock rather than the Australian banks…………………??????????????? Per-vote subsidies (2004 to 2015) – allocated according to the votes of Canadians. Electoral expense reimbursements – reimbursements allocated according to party spending during election periods. The per-vote subsidy (amounting to $27.7 million in 2009), also referred to as the “government allowance”, the “quarterly allowance”, or the “direct public subsidy”, was argued by some political commentators to be the most democratic of the three funding mechanisms: The choices of 100% of voters of eligible parties (13,675,146 individual Canadians or 99% of all valid votes in the preceding election) are taken into account, all on an equal-basis. While some argue that political contributions are democratic by virtue of being completely voluntary, statistics show that upper income individuals make the large majority of political contributions and stand to gain the most by way of tax incentives for those contributions. There are ways to cheat the system, but there are penalties if individuals and/or corporations are caught. To fix the US System it will take public outrage and anger, plus a sense ‘to do right’ by politicians. Both of these situations appear to be lacking from what I can see. I would have thought people like Erin Brokovich, Dr. King, Woody Guthrie, and Joe Bageant would have set the tone. I guess people are more interested in the Kardashians and where Romo will be playing next year. Meanwhile, Ted Cruz and wife Heidi had supper tonight with ‘the Donald’. That pretty much says it all about outrage, doesn’t it? Actually it says what Wolf is stating, nothing has changed and these people follow the money to stay in front of your TV screen and on the ballot. It is That simple. We, the people, created this, we allowed it to happen for the last 100 years. People remember what Eisenhower said, but did nothing to follow thru. Please do not be so deceived as to think that both Clintons were not deep in the money….one does not ‘take’ 250K per speech from banks and foreign governments and not make promises, or from the likes of George Soros. If it was not for Bill Clinton, we might actually have a sound banking system to this day instead of one run by rats which you will bail out again very soon. Billy signed it as the republicans had the votes to override the veto, it was REPUBLICAN LEGISLATION. If you wish to apportion blame for something that should never have been done, at least put the blame in the correct place. Billy always tried not to start bun-fights, he couldn’t win. Which is why he is still a popular, democratic, and presidential, figure. Did the rupukes have a 2/3rd majority in the House and Senate when Billy Boy was Prez? From the quote above the dolt was in favour of the legislation as were most demonrats as well. Get the facts right – Billy would have vetoed the bill if he didn’t like it and the demonrats would have gone along with him killing it. He did veto it initially in May when it passed the Senate 54 to 44, but he had Neal Wolin (and others) rewrite it to include the CRA and a few other tidbits. In November, it passed the Senate 90 to 8 and the House 362 to 57; then Bill signed it into law. Obama appointed Wolin to be Timmy Geithner’s Deputy Secretary of the Treasury right after he was inaugurated. Hell, you gotta reward the man who did Wall Street’s bidding by repealing Glass-Steagal, eh? The CRA was used by the Pritzker family’s Superior bank of Chicago to fleece the sub-prime sheep of Illinois, but they went overboard, and had to pay a little $460 million fine to Uncle Sam in December 2001. Notice the number eight entry of donors from above. Obama appointed Penny Pritzker to be Secretary of Commerce in May of 2003. At that time she had a net worth of over $1.5 billion. Now I wonder if lee read your comment. With all those nice accurate numbers in it. That confirmed what I basically knew, thank you. Billy could not have stopped it, no matter how much he wanted to. Both parties are playing us and have no resemblance to the party of FDR or Lincoln as they like to push on us. The Republicans seem to be the ones to push us into crashes while Democrats play good cop to clean up. The cliff they are sending us into is more about derivatives and the casino economy. More than Glass Steagall deregulation of derivatives by Foreclosure Phil Gramm has led us to this point. The real estate, housing and possibly health care deregulation will be churning up another foreclosure and who knows what kind of disaster a health care implosion will look like where the billionaires and Wall St will cash in. Let’s hope there’s some common sense and true patriotism left in both parties. There isn’t, there hasn’t been since Eisenhower. As neither of them would never have let the MIC Cabal, get away with removing Kennedy, if there was. The MIC Cabal that removed Kennedy. Nurtured what has become, the Globalised Vampire Corporates, currently allied with china, that own the American duopoly. They are protected by the idiotic US constitution, that guarantees 2 senators from each state. The cornerstone of the duopoly they own. What worked for America in 1770 and 1870, is today killing it. Increase to 3 senators per state, or reduce to 1, Either would help, along with Term Limits. Trump is becoming, or has become an establishment Whore. Very sad! The swamp is eating him, on time as well. So when the swamp fails in the next 5 years. Who gets the blame? P45 is a third generation, Swamp Creature. He has just changed Swamp’s. From, organized crime, to politically organized crime. The only people (criminals) in the US, immune from insider trading prosecution. Senate and Congress. But why not pay senators and congressmen huge salaries? In a day and age in which a minor league baseball player called up to the majors makes a minimum $500k, why are senators making $174k? If we paid them more, perhaps they would be less inclined to do the bidding of lobbyists and cartel cronies. Also, a high salary would set them up for life… and so what? At least they wouldn’t be jockeying for lucrative jobs in the private sector once their terms are up. And just maybe, more folks who are NOT rich might be able to run for office. There are only 535 members of Congress. There are 3 times as many players in the NFL. Congress critters are rare. Pay them accordingly. It’s not such a crazy idea. Some research argues though that it would have little impact on developed high-income economies. See http://voxeu.org/article/higher-government-wages-may-reduce-corruption. My Congressman, Kieth Ellison, doesn’t show up to do his job much of the time. He’s busy representing you on MSNBC, CNN, and the DNC. Stop whining. During Ottoman Empire, the high ranking government officials were paid insane salaries/income, but they had to take care of the people and infrastructure in the regions they represented. Imagine us paying a Billion dollars in salary to each congressman, but expect them to take care of the schools and hospitals in their regions. It worked great for hundreds of years and made Ottoman Empire one of the biggest and strongest states of all time. The comment about the Ottoman Empire is so far off the mark it has to be corrected. You must have been listening to Erdogan and his Ottoman fantasies! High officials lived off the taxes and tributes they collected from the unfortunate peasantry and merchants. A primitive Central Asian tribute-type economy. Neither life nor property were secure, as being in office for only a short time they did their utmost to fleece the people. This was all well observed by European travellers in the Ottoman Empire in the 19th century. Oh, and if you didn’t have money they took taxes in kind: children were acceptable payment. The trade in eunuchs particularly disgusted him: by castrating a boy slave, his value to the vendor increased by up to 7oo%! The mortality rate was between 25 to 75%, but the excellent mark-up made it a roaring trade despite all attempts by Europeans to stop it. The ottoman’s were also the original non East Asia source, of Opium. That initially fueled the Opium/Silver, Silver/Tea trade. Until BEI cut the ottoman out of the deal, by establishing their own Bengal field’s. Everybody blames the British for chinas opium use. This is another anti British, chinese false history, lie. Its as pathetic as blaming south America, for the US cocaine and heroine use. The South America States, feed and nurture the demand, they did not originally create it. Great Ottoman Empire was outsmarted and crashed by Katherine The Great – Russian Impress. Yes, I hear you… those damn Russians again. And with respect to your suggestion to pay more money to those hopelessly corrupted fat cats sitting on the Hill – there will be never enough for them. Until we, the people continue being lazy to learn more about those who we keep reelecting to represent our interests, we will continue to get the government we deserved. All political offices should be filled by draft. Instead of registering to vote at 18 you must register for the political draft. If your number comes up you must do your duty as a public official for the designated term. We could not be any worse off than we are now and most likely would be far better off. Because the would still sell you out. This is what a lot small asian countries are doing, I know Hong Kong and Singapore were doing it for ages, their high government officials gets paid as much as a CEO does, and their yearly bonus are tied to how well they govern as there are panels of people voting on them every year, gets covered pretty much like NFL stars here, and the laws restricts corruption are also very strict, and punishment very hash. Public financing of elections would change everything. 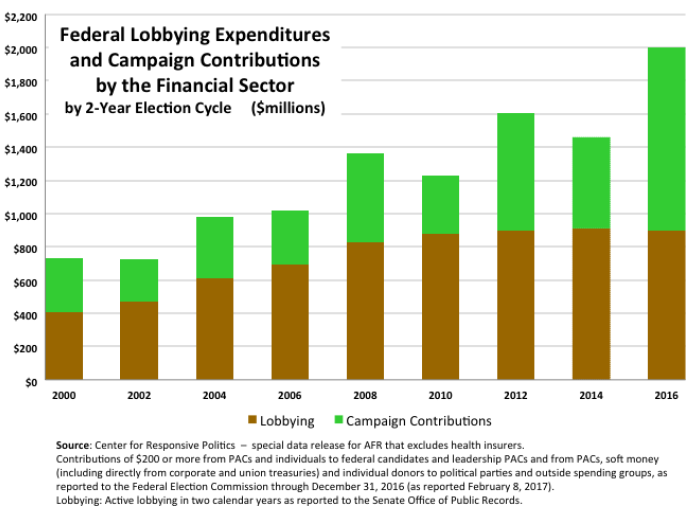 Candidates get a fixed sum of money to campaign with at the beginning of an election, and that’s it – no big wig donors, no PACs, no lobbying. This is the only way to get our government back to working for the people, not their donors. Anything else is just rearranging the deck chairs on the Titanic. After the Citizens United ruling, it would require a constitutional amendment. Not going to happen. 1. Public financing does not work well when you have a 2-party system. no it dosent, it encourages other entrants. The corporate owned, electoral finance model you have, ensures the duopoly, the corporate’s own both sides of, continues. The first step to breaking it. Is by going to public financing. “that dosent work well” is simply ensuring the current model continues, which also dosent work well, and guarantees the continuation of the corporate owned duopoly. a corporate owned duopoly, that does only what the corporate’s who own it, want. The current US system. a public owned duopoly, that the public can tune the financing of, that might do some things, the public want it to. Pretty obvious to me, which is the better deal for the electoral public, of the Two. It’s not “my system”. I can’t stand the duopoly. I can’t stand Citizens United. I can’t stand the Koch Brothers. I can’t stand Wall St and other big money corrupting the system. BUT: That does not mean I am for “public financing” (PF). People who think PF will get rid of corruption are fools. They do not understand that PF makes it EASIER to corrupt the system by moving the influence of money to earlier stages of the candidate selection process, where LESS money buys more results. Look, it is the VOTING SYSTEM that needs to be changed to support a multi-party system with proportional representation in Congress. That , plus overturning Citizens United, will get us a long way. Then forbid any person from contributing more than $1000/year total to political parties or causes. Forbid corporations from contributing anything at all. Watch multiple parties compete to enact the will of the people. THAT is how you fix corruption. Weimar Germany had proportional representation and 14 political parties represented in the Reichstag after each of two national elections in 1932. The Republic lasted about 14 years before the Nazis took over. Most countries in Europe now have proportional representation but are dependent on coalitions to form a government. Some are more unstable than others. Italy has gone through dozens of governments since the end of WWII. Belgium went through a period of politcal instability from 2007-11 and had no governing coalition in office for a time. I agree that the Citizens United decision was a bad one and should be overturned by a future court. Sheldon Adelson spent over $100 million in the 2012 election cycle to buy influence with Republican candidates. I wonder what he spent in the 2016 cycle? As Republicans get set to slash medical insurance subsidies for the poor and near poor, you can be sure that aid to Israel will not be touched. No Republican wants to face a future primary opponent funded by Adelson and his wealthy friends. And that just like real tax reform. Is never going to happen, under the corporate funded duopoly. You are trying to take to many steps at once so you will achieve nothing. To get real tax reform, you need campaign funding reform. Neither of which, the current corporate owned congressional system will support. Which is why we come back to the first step in this reform process. Term limits. Term limits, is how you start this reform process, which will probably take 2 decade’s at least. As term limits, the current old guard can be bullied into. They know it is the thin end of the wedge, but they will be gone before the gravy train gets truly upset, so they can be made to play. Everybody in congress and the senate, knows the system must be changed, but not whilst they are at the trough. Once you get Term limits, real Campaign funding and tax reform, become possible. As the churn cycle, is much shorter. Term limits are great. But in California, we’ve had term limits for decades (relaxed somewhat in 2012), and they’re not exactly performing any miracles, that’s for sure. Yes as that’s where you stopped. Ca is a big state, but its 1 in 50. The slightly reformed system in CA, is still fighting the unreformed other 49. Hence progress is still small. Maybe CA should move a state electoral funding change. That is the next step in the process. Also I believe you can leave CA and be elected elsewhere, which also defeats the CA/term limit intention. I’d love to see 250,000 people protest in Washington with Louisville Sluggers in hand. The corruption in this country with regard to the oolitical class has gotten so bad and so out of control that I regularly pray at night that the aliens will come down and abduct John McCain, Lindsey Graham, and Dianne Feinstein some time soon and disect them in some kind of research project. Retired babyboomers keep returning these kleptocrats back to office over and over ahd over….. Retired babyboomers are a dying breed. The oldest are now over 70. It is up to bored millenials to turn off their cell phones and go vote in future elections. Yes, millenials are too busy playing on their smart phones to make comprehensive decisions and support the family values that are the cornerstone America was built on. More than likely, lack of opportunity will force them to change their ways if only their parents would stop coddling them. Why do they support gateway drugs, war mongering and insane military budgets that cause societal displacement while transferring wealth to special interest groups, as opposed to border control and elimination of policies that subsidize offshoring? And they’ll have a completely different choice. Instead of voting for corrupt Republicans or corrupt Democrats, they’ll get to vote for corrupt Democrats or corrupt Republicans! You forgot that other one, Nancy Pelosi……………. Short of a 100% Henry George style tax on property profits there is just no way to stop government from rigging real estate markets. It is what government ‘sells’ to the public. You can make all the campaign finance rules, lobbying prohibitions and bans on revolving doors you want but as long as the government is in the business of selling tax law there is no way to ‘keep money out of politics’. Disagree somewhat with the major premise that’s implied – draining the swamp completely is needed for permanent change …. Simply put, there will always be crooks and opportunists and the best way to steal from you is to look like your friend and get you to offer me what you have and I want. I will, of course, humbly accept it and then look like I am giving you value for it when I am really just giving you a little of your own money back and calling it a benefit of your great decision to support me. The best way to motivate you is to fake a crisis. Then I will save you. At a price, which we, together, will ‘decide’ to get substantially from someone else. All you need to do is support me, donate, and get others to go along. Then you win and I help you win some more as long as you allow me to continue with my hard work helping you. Look, I’m giving you free benefits. We’re getting it from someone else! I’m an investment in your future. Seriously, the best Trump can do is remove a few cornerstones and key stones. If he can topple a few structures to the point of them being uninhabitable, he can declare victory in that swamp. He doesn’t have to fill the swamp and build a subdivision or a parking lot. That’s wasting resources. No matter how well he does, a new swamp will grow somewhere else spontaneously … it just won’t be big at first unless the bad guys win the lottery, such as when the globalists made their big consolidation move in 2009. Me, I really want to see a few of the current bunch tossed in jail. I want to see grand juries formed and politicians forced to testify. I want to see a Clinton in jail and a McCain having to explain himself and a few neocons cleaning toilets. Go after the royalty, not the fringes. And I would especially like to see Economics, aka ‘Oracle Science’ decimated and replaced with something else. This new invention will be just as phony, but it should be so different that people are both smitten with it and scornful of the current charlatans who convinced the world to capture and re-purpose central banks world wide. Unfortunately, the Eurozone will collapse as a byproduct of this new-found insight. But, they did it to themselves and, according to many notable economists, they only owe it to themselves so there is no issue with the bottom falling out. 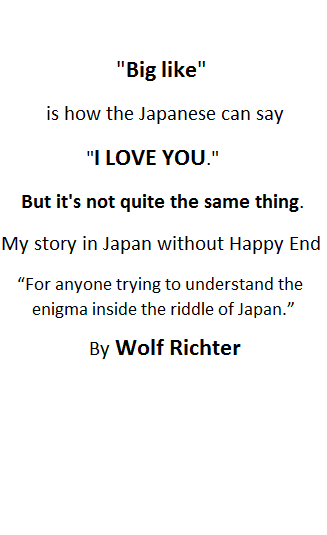 Wolf, you forgot to mention Apple. Over 5 million peanuts to promote their “Apple Pay” to Congressman. I suppose you can count Wells Fargo indirectly since I am sure that is why Buffett bought the stock ( or else to sell it to short covering gamblers and bank the profits). I used to see signs in the stores for ‘apple pay’, but they are all gone now. This must be so he won’t show up, since he has the WORST record of any Congressman for attendance. Guess the Kock Brothers are still by his side. South Florida put him back in office which is interesting since the Florida Legislature (R) literally hated the man and drove him out. I voted for Rubio the first time he ran, because the GOP wouldn’t touch him with a ten foot pole. Big mistake. This second time, he only won by running on Trump’s coattails. I suspect most of Rubio’s contributions were in support of his run for president in the primaries. At least two hedge fund billionaires were big contributors to his presidential campaign. Don’t forget Addleson. But maybe that’s Cruz’s sugar daddy. Or both. He likes those “cabana boy” types. I’m glad you are finally writing about money in politics because politics is big business in America. Nothing is bigger business, in our country, than the intersection of money and political influence. Even if you hate Trump, you have to give him credit for turning the light on to the corruption. Now we need to see how the cockroaches scatter. That is a BIGLY LOL. What world do you live in, Petunia? What world do you live in where they spell Big League like that? I don’t hate Trump, he just disgusts me. The “blow up everything” Trump voters are getting what they seemed to want, in spades. Bernie did a FAR better job exposing the corruption this political article deals with. So far I have no complaints about my presidential choice. You should watch or read what Chris Hedges said about Bernie when he began his presidential run. Basically, Bernie was running to make it look like Hillary had some opposition. In the end he caved, but his new lake front house must be a great consolation. Yeah, I would like to see Hedges in the White House. And you DON’T reflect his thinking at all, so gimme that link to that anti Bernie spiel….now! I did watch him tear up Krugman on a real news outlet, but not Bernie, who is still trying to work within the system (it’s all he knows, or has power in). Give me the word and a leader with money,people, equipment and plans and I’m for shooting up the Hamptons, or Hilton Head, NOW! Even if we all die taking a lot of those SOBs OUT. Anyone who can state that with a straight face should apply for Spicer’s staff…..give it a try, the pay is really good! This is a financial blog. This American partisan political BS mud sling you are engaging in, it to far from topic. It belongs on brietbart, politico, or other Facebook mud slinging sites, not here. When a man with money, meets a man with experience, the man with the experience will get the money and the man with the money will get some experience. I believe there’s an evil corrupt center that exists inside both parties (Grover Norquist/George Soros?) that places citizens last and special interest groups first.. Chances are slim that what looks like change is nothing more than more smoke and mirrors but at least the narrative has shifted (hopefully) toward exposing and purging special interest corruption. I’ve come to the conclusion that corruption has representation everywhere, including the comment section here. Once again, a teeny – tiny voice says: The more things change, the more they stay the same. Teeny – tiny same? If you’re in the big dog’s habitat, you’ll get eaten. Medicare… $40k/year pension, owns his real estate, and lives in West Virginia, one of the cheaper states to live in. Median personal income for Americans is only about $27k. Not impressed at all, really. Take a 1/3rd of that away, move somewhere where there’s jobs (and a higher cost of living), pay for healthcare… might be noteworthy then. Smingles, I was where you suggest I go, 65 years ago. Do you really intend to scorn me for seeing ahead and arranging my affairs so I could get away from there? Didn’t intend to scorn you, RD. The article you posted makes it seem like an accomplishment, to be living on a “just” $40k/year pension when he has no worries about major medical expenses, and owns his own property. The reality is most Americans will retire (if they are able to retire) with far less than that. So to my point: I would be impressed if he was doing it with far less, but the reality is he has a darn good retirement set up, yet he makes it seem like he’s accomplishing something difficult. Sorry, but I think the C ertified I nsane A gonists got to those first ! may they be buried in them …. ! a substance which initiates a physiological response when combined with a receptor. a muscle whose contraction moves a part of the body directly. Instead of limiting the ‘source’ of money in political campaigns, which special interests consistently block, legislation should attempt to limit the ‘use’ of this money. It has been widely reported that political campaigns allocate most of their budgets to “Media” or “Ad-Buys”. From the perspective of a political candidate, the competitive advantage of campaign money is increased Media promotion, and preferential name recognition through advertising. More campaign money means more Media promotion, and greater preferential name recognition. If most of the money raised for political campaigns is allocated to Media, then reducing the cost of Media campaign Advertising to Zero would effectively eliminate the need for most of the budget of a political campaign. What might address this is legislation which provides Media Companies with an Income Tax-Deduction for the “Full Market Value” of all Advertising ‘Donated’ Free of Charge to a political campaign for the promotion of a candidate. This is the carrot to induce politicians and media to abandon large campaign contributions. A stick to accompany this carrot would be a higher penalty tax rate, or tax that cannot be offset by any deductions, for Media Advertising Revenues derived from campaign contributions. If Media Companies consider this Income Tax-Deduction (and tax penalty) of comparable benefit to the Advertising Revenue generated by a political campaign, they might donate sufficient Free Advertising for the candidates in a political contest. With no need for “Media” or “Ad-Buys”, political campaigns would no longer need to raise large sums of campaign money. Removing the need to raise large sums of campaign money, removes the corrosive influence of money in politics. I like your naivete. Campaign contributions aren’t needed to buy big media. That’s just the excuse. Campaign contributions are needed to make the elected official wealthy. Yes they buy media. But they do this by paying their buddy Dave $5 million to buy $1 million of media. Dave also happens to have the candidates wife serving as Director of HR who is paid $2 million a year. My Congressman is a gentleman by the name of Bill Posey (R). Bill was a moderately successful real estate agent who lived in a 4/3 bungalow worth around $250K. He now lives in a multi, multi-million dollar water-front worth around $10 million. That’s after just 4 years in Congress. And you haven’t even gotten around to the local politicians and their connections to Wall Street. When I lived in Palm Beach County I couldn’t believe all the financial types sitting in elected positions on the local level. Our taxes were high due to NO BOND DEAL LEFT BEHIND. Pardon me if I’m misinterpreting the information but it seems to me the numbers in regards to the NAR’s contributions tell the potential home buyer from lower to upper middle class everything they need to know . The swamp is the symptom. The cause is the fact that government has too much power in the economy and where wealth transfers to/from. If the cause stays, symptoms can be all kinds that people will find it hard to imagine. Simply put, if the government has no power to bailout in 2009, all of the corruptive source have already died. The swamp would be automatically drained without needed anybody’s power to drain it. If you think let’s give Trunp more power to drain the swamp, he may drain version 1 and produce version 2. Get government out of economy and wealth transfer. Limit them only at national security and law enforcement. Where we are today in terms of corruption is because the voters themselves are corrupted. They think giving government power to TAX, and transfer wealth to them will do good for their selfish reasons, only to find out that the GOV is corrupted in another way to go against them. I know. De-power GOV may NOT be good for a lot of things. But i can guarantee you corruption will stop. The choice is, do you want swamp drained or do you want something that is corriptible but only corruptible for me, NOT anyone else. The best way to reform the system is just to require that all campaign contributions are anonymous. Won’t stop people from contributing to elect the person they want, just means he/she won’t know who to pay back. i can guarantee you that information will leak legally because you can not stop free speech. when the US Financial Sector gives a Congressman $3.7 Million; what do they get for their money ? A Christmas Card ? A ticket for the Dodgers ? A night with the Wife ? The Congressman`s Vote ? His Soul ? His Bank Account Details ?